Conservative Hangout: Remember When 'May Day' Was Fun? Occupy This. The Occupy Wall Street freaks are set to ramp-up more disruption on May 1st. May 1st, also known as "May Day," used to be an "innocent" day of fun and doing friendly things for your neighbors. Not anymore. Occupy Wall Street demonstrators, whose anti-greed message spread worldwide during an eight-week encampment in Lower Manhattan last year, plan marches across the globe tomorrow calling attention to what they say are abuses of power and wealth. "Occupy The Bridge" has their own little blog on WordPress. Here it is. Since the conditions for the action will not be met, we are no longer organizing to shut down the bridge. As always, any action taken by the workers at their workplace or against their employers will be met with our support and solidarity. 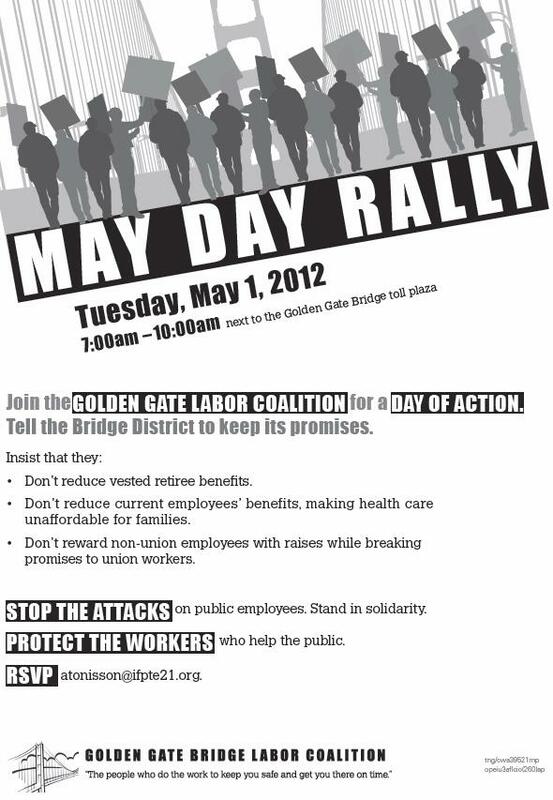 Although we will no longer be organizing a bridge shutdown on May 1, we encourage all individuals, labor activists, and supporters to stand with workers on the picket lines at the ferry and bus terminals and any other locations they attempt to shut down. These workers are among many in the public sector whose jobs and benefits are being attacked. They deserve our full support. A General Strike will not just occur at one workplace or one thoroughfare but throughout the whole Bay Area. There will be May Day worker and student protests and strikes in Oakland, San Francisco, small and large U.S. cities, and around the world. The status quo is unacceptable and May Day actions will demonstrate that the working class is no longer willing to abide by it. On May 1, workers and students throughout the country will walk out of their jobs and schools in an unprecedented General Strike. As a part of this day of action, thousands of nurses in Northern California will be striking Sutter hospitals. ILWU Local 10 will also be shutting down the Port of Oakland for eight hours in honor of the historic May Day struggle for the eight-hour working day. There will be protests in Oakland, including a mass march for immigrant rights and an evening convergence on Oscar Grant Plaza. Sounds expensive. It also sounds like these people don't care who their actions affect as long as THEY get what THEY think is OWED to them (which is typical of the vast majority of union workers).